We participated in the 6th Cultural Heritage East Asian Network assembly held in Solo, Indonesia, at the request of the Agency for Cultural Affairs. In the assembly, representatives of ASEAN countries and three countries in East Asia (Japan, China and South Korea) participated and reported on projects developed by ASEAN countries. The Japan Center for International Cooperation in Conservation made a report on the survey on restoration of damaged cultural heritage, conducted in 2009. This was conducted in the framework of the project of Japan Consortium for International Cooperation in Cultural Heritage, and commissioned by the Agency for Cultural Affairs. Responding to our report, the participating countries indicated their hope for actively surveying cultural heritage, and holding workshops and meetings in the future. From South Korea, the director of the Cultural Heritage Conservation Science Center of National Research Institute of Cultural Heritage participated, and the 7th assembly will be held in South Korea. It is conceivable that the importance of the assembly will further increase in the future to deepen the relationship between ASEAN and East Asian countries. 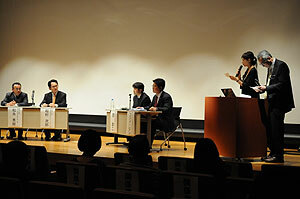 As part of the Consortium program commissioned by the Agency for Cultural Affairs, we held the above-mentioned symposium at the Heiseikan Auditorium of Tokyo National Museum on December 14. The symposium started with a keynote lecture on the activities of UNESCO for compatibility of the protection of world heritage and the development for tourism followed by reports from two specialists. Mr. Noriaki Nishiyama pointed out the importance of the viewpoint of “living heritage” when considering cultural heritage and tourism, and Mr. Yuji Seki gave a presentation on a case in Peru where the protection of cultural heritage and the building of museum were promoted through the strength of the community. The Japan International Cooperation Agency (JICA) reported the activities for tourist destination development, including the case in Jordan, and Ms. Naoko Hamajima, who has been visiting every corner of the world as a TV reporter, proposed a method of tourism enjoying seeing cultural heritage. 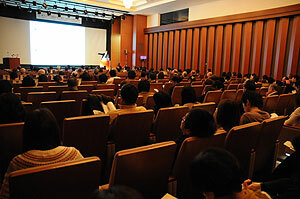 Along with specialists, many regular citizens attended the symposium and asked questions. Discussions were held on how to contribute to local communities through international cooperation and on the specific methods and issues in protecting cultural heritage using tourism, as tourism which does not conflict with the protection of cultural heritage is a hot topic. 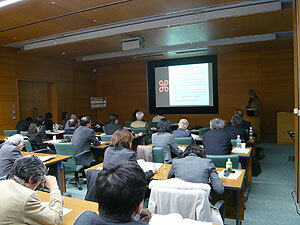 The fourth workshop of the Japan Consortium for International Cooperation in Cultural Heritage, “Cooperation in Economic Development and International Cooperation for Cultural Heritage”, took place on March 26, 2009. We invited Mr. Meinolf Spiekerman of the German Agency for Technical Cooperation (GTZ), Ms. Kalin Ceebee of the Swedish National Cultural Heritage Board, Cultural Heritage Committee and Mr. Morita Takahiro of the Japan International Cooperation Agency (JICA) to give lectures about ideal cooperation for economic development and cultural heritage conservation by Germany, Sweden, and Japan. GTZ provides support packages for health services, traffic control, and other services, while making use of conservation of historical cities in an urban development cooperation framework. The Swedish cooperation for Tanzania aims at improving the hygiene of the inhabitants and eradicating poverty by restoring historical buildings. Over 50 people participated in the workshop, where they discussed the collaborative institution status of various organizations for implementing support and how the uniqueness of one’s native country can be adapted to a partner country. The Consortium will continue to provide the latest information and also a place for discussions through workshops. In Hadhramaut Province in eastern Yemen, many houses have suffered from the disasters caused by torrential rains and flooding that occurred at the end of October 2008. 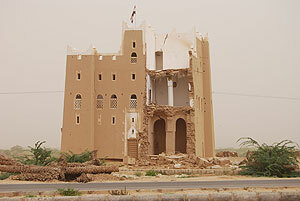 The damage from flood covered Shibam, a World Heritage site that is called the skyscraper of the desert. The Japan Consortium for International Cooperation in Cultural Heritage, the secretariat of which is located at the Japan Center for International Cooperation in Conservation, accepted a request from the Yemen government and dispatched specialists from February 10 to 21 to survey the flood damage to the world heritage Shibam and its surroundings. 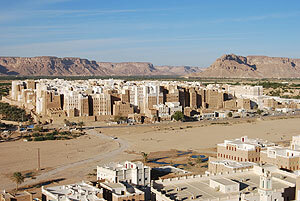 Tall buildings made from mud bricks equivalent to those found in Shibam are found scattered throughout Hadhramaut Province, forming a unique cultural scenery. However, the torrential rains and flood damaged the cultural heritage and historical buildings in Shibam and also those on the periphery, as some buildings cracked or collapsed. We will investigate how we can support the restoration of cultural properties in this area while discussing with related organizations.